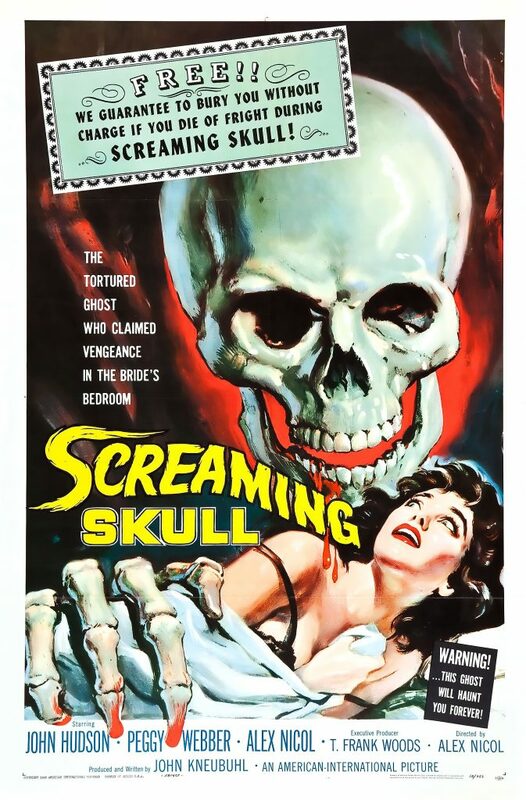 The Screaming Skull is a 1958 independently made American black-and-white horror film, produced by John Kneubuhl, T. Frank Woods, and John Coots, directed by Alex Nicol, that stars John Hudson, Peggy Webber, Russ Conway, and Nicol. The Screaming Skull marked Nicol’s directorial debut; he decided to try it because he felt that he was not acting in the roles which he wanted. The film was distributed by American International Pictures on a double bill in different markets with either Earth vs. the Spider or Terror from the Year 5000. The film’s storyline concerns a neurotic newlywed woman who believes she is being haunted by the ghost of her new husband’s previous wife. Over a scene of an opening coffin, a narrator explains that the film’s climax is so terrifying that it may kill the viewer, while reassuring the audience that should they die of fright they will receive a free burial service. Inside the coffin is a card that reads “Reserved for You”. Newlyweds Jenni (Peggy Webber) and Eric (John Hudson) move into Eric’s palatial country home. Jenni is Eric’s second wife; his first wife Marion died when she accidentally slipped and hit her head on the edge of a decorative pond on the estate. At the home they meet Eric’s friends, the Reverend Snow (Russ Conway) and his wife (Toni Johnson), as well as Mickey (Alex Nicol), the developmentally disabled gardener. Eric privately mentions to the Snows that Jenni spent time in an asylum following the sudden death of both her parents, and Mrs. Snow reveals that Jenni is very wealthy. Jenni is disturbed both by Mickey’s belief that Marion’s ghost wanders the estate and by Marion’s self-portrait inside the house, which Jenni believes resembles her mother. When she begins to hear unexplained screaming noises and see skulls around her house, she believes that Marion is haunting her. Though Eric speculates to Jenni that Mickey, who was a childhood friend of Marion and thus dislikes Jenni, may be behind the trickery, Jenni worries that she is going insane. Eric suggests to remove Marion’s self-portrait from the home. Eric and Jenni take the painting outside and burn it. While they clean up the remains of the painting, a skull emerges from the ashes. Jenni panics at the sight of the skull, but Eric denies that the skull is there. Jenni faints and Eric withdraws the skull and hides it, revealing that he has been gaslighting her all along. Believing she has finally lost her sanity, Jenni resolves to be committed. She tells Eric that the entire property will be meticulously searched for the skull as a last resort. Mickey secretly steals the skull and brings it to Snow before Eric can retrieve it. That night, Eric prepares to murder Jenni and stage it as a suicide. Jenni sees Marion’s ghost in Mickey’s greenhouse and flees back to the house, where Eric begins throttling her. The ghost appears and chases Eric outside, corners and attacks him, drowning him in the decorative pond. After Jenni regains consciousness, the Snows arrive. Mrs. Snow comforts a hysterical Jenni and the Reverend discovers Eric’s body in the pond. Some undisclosed time later, Jenni and the Snows depart from the house. Reverend Snow declares whether or not Marion’s death was an accident will remain a mystery.